Made with whole-wheat flour, these decadent-tasting brownies have a beautiful marbled cheesecake topping. Cutting them into bite-size pieces helps to keep the calorie count in check. Preheat oven to 350° F. Coat a 7-by-11-inch brownie pan or baking pan with cooking spray. To prepare topping: Place cream cheese in a small mixing bowl and beat with an electric mixer until smooth and creamy. Add sugar and beat until smooth. Add egg, flour, yogurt and vanilla; beat until well blended. To prepare brownie layer: Whisk whole-wheat flour, cocoa and salt in a bowl. Place egg, egg whites and brown sugar in a large bowl and beat with the electric mixer on medium speed until smooth. Add oil, coffee (or tea) and vanilla; beat until well blended. Add the dry ingredients and beat on low speed just until well blended, stopping once to scrape down the sides. Scrape about half of the brownie batter into the prepared pan. Slowly pour the topping evenly on top. Drop the remaining brownie batter in large dollops over the topping. Draw the tip of a sharp knife or skewer through the two batters to create a swirled effect. Bake the brownies until the top is just firm to the touch, about 20 minutes. Let cool completely in the pan on a wire rack. Coat a knife with cooking spray and cut into 24 bars. 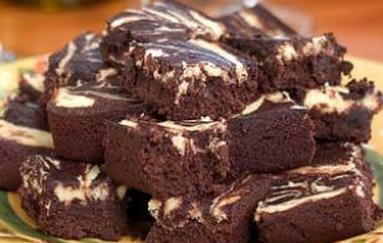 Make Ahead Tip: The brownies will keep, covered, in the refrigerator for up to 2 days. (Alternatively, bake brownies in an 8 1/2-by-12 1/2 -inch foil pan, wrap well and store in the freezer for up to 3 months.) Bring to room temperature and cut into bars shortly before serving.